@Slade wrote: Kind of necroposting here. I've been thinking about Kylo and Snoke's relationship. It may seem like I"m beating a dead horse, but what traits/behaviours of Kylo's make you (plural you) think Kylo was abused by snoke (as opposed to kylo's behavior being caused by other trauma)? I tend to think Snoke did abuse him somehow, but I'm just curious to hear other takes on this. I'm wondering of some of y'all picked up on different behaviors than I did. What do you think of the people out there who don't see anything wrong with Kylo/snoke's relationship? I have seen some people say it was a healthy mentor/student relationship (??). Do you think those people just were not paying attention? Also, what elements are making us identify snoke/snoke's relationship with kylo as pervy? I agree that it is pervy; I'm just wondering what things led other people to that conclusion. Yes, it is weird that Snoke chooses to project a holograph of himself that is massively tall. The only other holographs of people I recall in SW were actually smaller than adult humans. I know that she'll survive the trilogy, and I doubt that she'll go "full dark" (although I could see her using the dark side once or twice in the heat of the moment...which should help her develop more compassion for Kylo), but I am so, so creeped out at the prospect of her actually being brought to him. And no, I don't think that Kylo will do it, unless it's part of some larger plan that they cook up together. Oh, yeah. I think Snoke would do something like try to force Kylo to kill her. And I don't think Kylo would ever take her to him (unless it was a plot to kill Snoke). That line was forshadowing, she'll have to confront him. He may end up regretting it, look what Leia did to Jabba. The overarching granddaddy of all perviness is the fact that he was in a kid's head and stayed there his whole life. It's the supreme violation because even a child abuse victim in real life can escape into his or her head. It's going in and touching the ultimate center of privacy and personal space with absolutely no permission or right. Ben had no choice in the matter, was, in fact, incapable of making of choice, and had no way of getting out. There is a real argument to be made, tying into @snufkin's post, that a big part of him really doesn't know the difference because it has probably been the one consistent thing in his life. Actually, I have had the opposite thought. I definitely think Rey is going before Snoke. She needs to have that moment. However, I think Snoke will want her *to kill him*, (I have a feeling he might be sick of Kylo, especially if Rey has what he wants as well), and will try to manipulate her heavily to think Kylo deserves to die. I think this will entail Snoke encouraging her anger and sense of righteousness (she might already be in a bad place because of some parent reveal or whatever) and getting into Rey's head the same way he does Kylo and I think she could get quite close. It'll be love that causes her to snap out of it ... and that love might come from him (i.e. him telling her that "yes, he doesn't deserve to live, but that she can't give herself to Snoke"), and then she will intimately understand why he became what he became. I also tend to think it'll be something like that...foreshadowed by the "Snoke is using you for your power; once he gets what he wants, he'll crush you" line from Han. I just really hate thinking about this scenario with Rey. She had such a crap life for most of her life, and I can see Snoke dredging up all of those feelings of abandonment and worthlessness for her. I'd find that very difficult to watch. I agree it will be tough, but when she overcomes it ... (when she does what Anakin couldn't do when she is coming from a much worse place) ... she will be the most rock star hero in SW. Also, it will give Daisy some great, possibly "career-making" screentime. Further, she and Kylo Ren (since he was messed with since childhood) will be the toughest mofos ever ... and considering how she and Kylo and Finn were all "children of war", it would be fitting. It would be like those Depression kids who had to fight WWII ... which was the result of serious mistakes made by earlier generations. Yep. Dude doesn't even believe it. Brilliant acting...that expressionless, mentally checked out face and stilted tone of voice. I just noticed something curious.... Snoke's holo room reminds me a little of the Alderaan Refugee Conference room in the Clone Wars... it may be nothing but it is interesting that they look so similar..... the conference was to care for refugees fleeing their planets because of the clone wars... it is similar to the situation of the imperials who fled the galaxy to the unknown regions in search of a new home and then formed the FO... could this be a hidden clue? @panki wrote: I just noticed something curious.... Snoke's holo room reminds me a little of the Alderaan Refugee Conference room in the Clone Wars... it may be nothing but it is interesting that they look so similar..... the conference was to care for refugees fleeing their planets because of the clone wars... it is similar to the situation of the imperials who fled the galaxy to the unknown regions in search of a new home and then formed the FO... could this be a hidden clue? I remember that JJ quote comparing the FO to post-WW2 Nazis trying to rebuild the old order. I couldn't find the quote, so thank you for posting it. I found it interesting that JJ mentioned the possibility that the FO could see Vader as a martyr because I wonder how much the FO actually knows about what happened in that throne room in ROTJ. 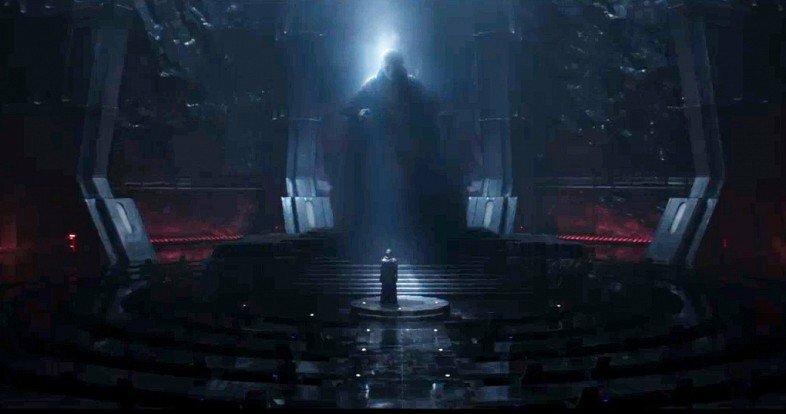 We know Snoke and Kylo know the truth, but I assume the FO believes Luke Skywalker killed Vader and the Emperor. If so, they wouldn't know the true story of Vader betraying the Empire and murdering the Emperor. I wonder what that knowledge would do to them? Also, what does the New Republic know? Did Luke keep the events of the ROTJ a secret since no one knew Vader was his father? The basic gist: Snoke wanted Ben to kill his dad because he feared if his student retained any loyalty to his family Ben would betray him like Vader did Palpatine, for the same reason. He learned from his predecessor's error and wanted to make his hold stronger on his pupil. yeah, that's the gist. Snoke is afraid of familial love. Which means he's underestimating romantic love. Reverse Anakin and Anidala if there was ever one. Does Snoke know what is love? I mean, he could understand it completely wrong and taught Kylo that love or family are nothing but temptation and seduction. Snoke could believe that Padme, Luke are the seducers that cause Vader to fall and he taught that to Kylo hence why he see family and family as negative, "By the grace of your training I will not be seduced"
he knows at least from observation. There are chunks of dialog in the novelization, some that were actually filmed but edited out, where he monologues about sentimentality and compassion as main weaknesses. I almost get a serious Miss Havisham and Estella vibe from those two, the younger being molded as a weapon against whatever injustices the older faced. @snufkin wrote: I almost get a serious Miss Havisham and Estella vibe from those two, the younger being molded as a weapon against whatever injustices the older faced. I've thought that was a possibility, too. I've thought about slightly modifying your theory about Rey, Finn, and Ben being specific targets because of (grand)parental ties to the Rebellion. What if Rey is a Kenobi, and she and Ben were specifically/targeted because of Snoke's hatred for the Jedi? Perhaps Snoke has some very personal reason to want personal revenge against the Jedi (and not necessarily the Rebellion)? I'd be surprised if it isn't both ideological and personal for him, especially from what's been said about the Claudia Grey book (I'm #9 on my library's wait list, so I haven't read it yet) climaxing with Leia being the victim of both an assassination and political hit. It seems very ugly. As for the Kenobi angle, there's a comment I think from the Visual Dictionary posted here that Snoke has expressly forbidden anybody in the FO every speaking Ben's actual name. Unless he's got a grudge against Han, what other namesake/which person does that leave? Somebody who was even more the exemplary Jedi than Luke and held true to that faith/ideology. It may pan out that she's actually related to somebody else in one of the previous trilogies, but my brain automatically goes towards peak drama of tying it together with how she was abandoned and the eventual showdown that has to happen with the Big Bad. They'd be cranking the angst up to 11 (beyond the standard Heroine faces the Big Scary Overwhelming Bad and his emo wuss henchman) for that angle. Plenty of opportunity for Snoke to do some Incredibles type monologuing and even slip in the final reveal of who her parents were and why they disappeared (my money's on being murdered trying to protect her from Snoke, automatic parallel to Han). I flunked out of Sunday School, but would I be correct in thinking that Obi-Wan is kind of the John the Baptist for the Jedi? He's a big frigging deal and powerful for his abilities, devotion, and martyrdom. Also the person who spoke directly to Rey in her vision. So that's why I tend to think that she's related and it's a factor in the inevitable showdown with Snoke. old ad astra crackpot snoke theory. all lifted from life debt so spoilers, beware. Just found a weapon that sounds like the sort of thing Snoke would use- the Darkstaff. It is found in an EU SW RPG game involving a special tree and a hidden jedi artifact. The darkstaff is an ancient sith artifact that absorbs the life essences of people (unless the person sacrifices themselves with love- Han? ), absorbs force energy from artifacts, destroys planets and systems, controls minds and turns living thing into mutants.... it can also teleport to other locations (maybe it helps Snoke remain on the move). It is immune to lightsaber and force power related attacks as well.... sounds like the type of weapon a super villain would use.